Colony: Season Four; Would You Have Kept Watching the Cancelled USA Series? The struggle (and story) of the Bowman family ends tonight. The Colony TV show has been cancelled after three seasons but, would you have watched more episodes and a fourth season? Should it have been dropped? A USA Network sci-fi drama, Colony stars Josh Holloway, Sarah Wayne Callies, Tory Kittles, Peter Jacobson, and Alex Neustaedter. The story unfolds in the near-future, in a world where citizens are under military occupation by the Colony Transitional Authority, as part of a large extraterrestrial invasion. Former FBI agent Will Bowman (Holloway) and wife Katie (Callies) were raising their daughter and two sons in Los Angeles, but were separated from the younger boy during the invasion and did everything they could to get him back. The third season kicked off six months after the season two finale, with Will and Katie rebuilding their family in the world beyond the walls. They begin a journey during which they uncover the truth behind the occupation. Once again, this family finds themselves having to choose sides. The show debuted in January 2016 and got off to a positive start with a 0.44 rating in the 18-49 demographic with 1.36 million viewers. The series lost some steam over the course of the season. The first year averaged a 0.38 rating with 1.13 million and it was renewed for a second season. Season two of Colony launched in January 2017 and the 13 episodes ended up averaging a 0.26 demo rating with 814,000 viewers. Compared to season one, that was down by 31% in the demo and 28% in viewership. 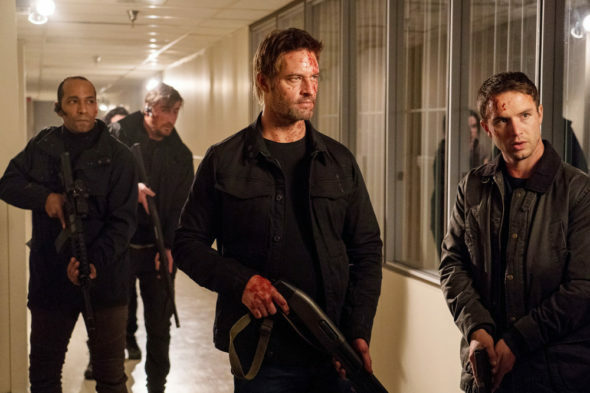 Still, Colony was renewed for a third year even before the season two finale aired. USA didn’t start running season three until May 2018. Thus far, the third season has averaged a 0.17 demo rating with 672,000 viewers. Compared to last year, that’s down by 36% and 18%, respectively. Colony is currently one of USA Network’s lower-rated scripted series but, other shows aren’t doing that much better. While it’s not a complete surprise that USA cancelled Colony, they could have easily renewed it to wrap up the story with a final season. Unfortunately, they opted to end the series after three seasons and 36 episodes. What do you think? Do you think that USA should have cancelled the Colony TV show? Should the series have been renewed for a fourth (and final) season or, is season three a good place to end it? More about: Colony, Colony: canceled or renewed?, Colony: ratings, USA Network TV shows: canceled or renewed? Colony: Is the USA TV Show Cancelled or Renewed for Season Four? Please save this show I can’t sleep at night knowing it was cancelled. At least finish the show with one last movie or something. I would pay money just to bring back this show I loved all the characters! Best sci-fi show out at the moment. Would love to see this show come back for another season. Needs a better ending. I looked forward to it each week. Bring it back one of the better shows on tv. COLONY — Great Show that my entire family enjoys watching. USA should rethink their decision. Maybe Netflix or Amazon could pick this series up. I’d pay to watch this show. Just like GOTHAM, series without political nonsense get cancelled. They moved it to a summer air time, when more and more people are outside and busy with life. What did they expect? Might as well have shown it at 4am on Mondays. Give a little Firefly action, and close it off with a movie (or two). Please, please don’t keep us in suspense! If they can’t or won’t do another season they could at least do a final “special” to wrap things up. Should have at the least had 2 more episodes to allow them to have the big ending it was all leading up to. Im furious. This is so wrong. Darn, it was just peaking my interest, with the other aliens showing up ready for battle and all. That’s definitely worth another season or two or three! Hey Amazon, how bout picking this one up and giving us what we want – more fresh sci-fi. They could have invested in Colony instead of drawing out “Suit’s the way they have. It should have ended two seasons ago when Mike Ross avoided prison. I very much enjoyed the show, and did watch all 3 seasons. I don’t think the show should have been cancelled, but like a number of other people have stated, if (USA) waz gonna cancel the show they should’ve done it properly by wrapping up the series with a season 4 that bringz all storylinez & characterz 2 a final & proper conclusion. I only discovered Colony in Season 3. I DVR’d it so I could share with my wife. We agreed it was going to be a regular, so I bought Seasons 1&2 on DVD. We just finished watching when I read it was cancelled. I am madder than a red hand in the green zone. Please reconsider; it deserves a well-crafted and ‘satisyfing’ end with one more season.